Jacobs-Townsley has been one of our top distance runners the last two years and we're not expecting that to change this fall. As a junior last year, she captured her second straight PVIAC and Central Western Division 1 titles. She was also fourth in the Division 1 All State Meet and fourth overall in the Championship Race of the Brown Northeast Invitational where she clocked a PB of 17:42.05 on the generous 5K layout. The Hurricane standout was dominant among her MA rivals in the two-mile run during the indoor and outdoor track seasons, winning individual titles at both All State Meets. She cruised to a PB of 10:49 at the outdoor meet. 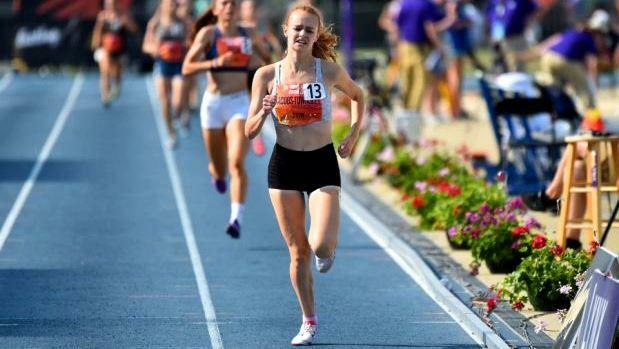 Jacobs-Townsley capped off her junior campaign by winning the Emerging Elite 2M at the New Balance Nationals (see photo above) in June. We're predicting Natick's Grace Connolly willcapture her third straight individual crown at the All State Meet. But don't be surprised if Jacobs-Townsley is among those runners that won't make it easy for Connolly.